For the vast majority of residential and commercial central air conditioning systems, the ductwork that delivers the conditioned air into the interior space is the weakest link. No matter how efficient or effective the equipment may be, the ductwork that delivers the conditioned air into the occupied spaces of a structure is the key to the effectiveness of the system. A high new high efficiency air conditioning system may have high tech controls and processes that are capable of outstanding performance, but when dependent upon a leaking, restricted or unbalanced duct system cannot deliver the performance it was designed and manufactured to provide. It can be likened to a high performance sports car with bald tires ; even the most high performance Ferrari with state of the art acceleration and handling capabilities is limited by the tires that connect it to the pavement. Today’s high performance air conditioning and heating systems are exactly the same ; when connected to the living space by a bad duct system the potential performance is diminished or even eliminated completely. Air conditioning system duct design begins with a room-by-room calculation of the peak heat gain that will be reached in each room during the hottest weather when subjected to the most solar exposure. The amount of glass exposure from windows and glass doors and the direction they face is the dominant factor in most cases. Once the total BTU’s of heat gain for each room is determined, the volume of conditioned air required can be determined. Ducts are sized and configured to deliver air proportionately to the heat gain rather than the room size. Johnson’s evaluates existing duct systems to assess whether duct retrofit or replacement is needed and to determine what measures provide the greatest return on investment. Some ducts are adequately sized and configured for the needs they serve but require simple duct sealing measures. 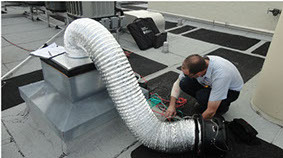 All ducts systems are scrutinized before equipment replacements are recommended. Johnson’s is one of less than a handfull of companies identified by the Florida Building Code as qualified to test ducts to be substantially leak free . There are only two individuals in Collier County who currently carry these credentials. Duct leak testing required for building code compliance purposes, DOE Energy Star projects or other projects that require certified testing stipulate these credentials and the equipment and methods to be used. Johnson’s maintains these credentials and utilizes the methods and equipment required. Duct testing, envelope testing and building diagnostics services identify sources of energy loss and moisture problems. Duct leakage is not a complicated issue to understand and be concerned about ; the vast majority of Johnson’s customers are eager to have duct leaks repaired. The location of the ducts is key to how important the leakage is. When ducts are located inside the conditioned space and cannot leak to outdoors ; losses are minimized. Ducts contained inside the sealed building cavities of a multistory building are leaking the conditioned air within the insulated structure and the treated air is not lost to outdoors. In contrast, ducts located in vented attic spaces are creating losses directly to the outdoors and are of much more concern. One of the best strategies used in SWFL to minimize losses is to locate the ducts within the thermal envelope of the building. Many existing vented attics have been successfully retrofitted with foam insulation that seals the entire attic space from exposure to outdoors. Leakage from ducts and through walls and ceilings are of far less concern when sealed within the structure. Often ducts have multiple issues and it is more effective to replace the ducts than attempt to seal them. Other times the ducts are adequate but just need sealing in locations that are accessible for sealing measures without demolition or replacement. When ducts are undersized, poorly configured or have excessive lengths, the fan used to deliver the conditioned air is less effective. Friction created by air molecules that scrub the interior surfaces of the duct builds up resistance to airflow that must be handled by the fan. Undersized ducts create excess friction and diminish the fans ability to deliver the needed volume of air. Fittings such as elbows, offsets, bends and branch connections are needed to direct the air to where it is needed within the space. Proper duct design and construction requires accounting for losses that occur when air changes direction within the ducts and configuring fittings to minimize losses due to friction. The type of duct material used also has a great influence in the rate of losses due to friction. Sheet metal ducts have the smoothest interior surfaces and develop the least friction. Fiberglass ducts and duct liners have relatively smooth interior surfaces and also have rather minimal losses due to friction. Flexible ducts have ribbed interior surfaces due to the helical inner liner and have the highest losses due to friction. Flexible ducts are used because they are require very little skill to install. They are popular in new construction where lower skilled workers are employed to install the ducts. They can be stretched out and connected at each end by workers with very low skills and do not require knowledge of geometry to fabricate. Many systems where installed primarily of flex duct because of the lower installation costs. These systems often have high losses due to friction and do not deliver air efficiently. Even if the ducts are installed using quality materials and without air leaks, the design, duct sizing or configuration may cause uneven distribution to spaces served. The size of the room served is not the only factor to be considered when designing ducts, the amount of heat gained through exposure to exterior walls, windows, doors and ceilings ultimately determines the amount of air that is needed to maintain the desired temperature. Calculation of the heat gain of individual rooms is needed to properly determine the amount of air that has to be delivered to each interior space served. Properly sized and placed air returns are also part of a properly designed duct system. Many structures have been built with only one air return to serve large spaces with multiple rooms. Conditioned air delivered to the spaces within the building have to take random paths back to the air handler to circulate often causing pressure imbalances within spaces. The pressure imbalances are significantly more dominant when the system is operating while interior doors between spaces are closed. The ideal duct system has air returns in all major rooms to which the air is delivered.